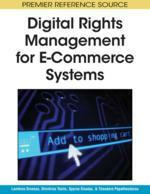 This chapter investigates intellectual property rights clearance of as part of e-commerce. Rights clearance is viewed as another online transaction that introduces certain technological and organizational challenges. An overview of the current intellectual property rights legislation is used to describe the setting in which business models and digital rights management systems are called to perform safe and fair electronic trade of goods. The chapter focuses on the technological aspects of the arising issues and investigates the potentials of using advanced information technology solutions for facilitating online rights clearance. A case study that presents a working online rights clearance and protection system is used to validate the applicability of the proposed approaches. “Rights clearance” is a term often used indiscriminately to describe a set of processes that are followed both in the physical and digital world. As a consequence, the “bad” use of this term and in general the terminology related to rights clearance is usually a source of many ambiguities and misconceptions that prevent readers from acquiring a common understanding on the issue. The goal of this section is to outline the related topics, address controversial issues and eventually formulate a clear basis that will help the reader gain an insightful view of the subject.